The regatta will be governed by the latest edition of the US Sailing Associations Racing Rules and the sailing instructions distributed at the Skippers Meeting. Eligible yachts must complete the registration form to participate in the regatta. Each yacht shall have on file a current valid PHRF rating certificate. If you do not have one, one will be provided. A skippers' meeting for competitors will be held at the stage on Saturday at 10:30 am. 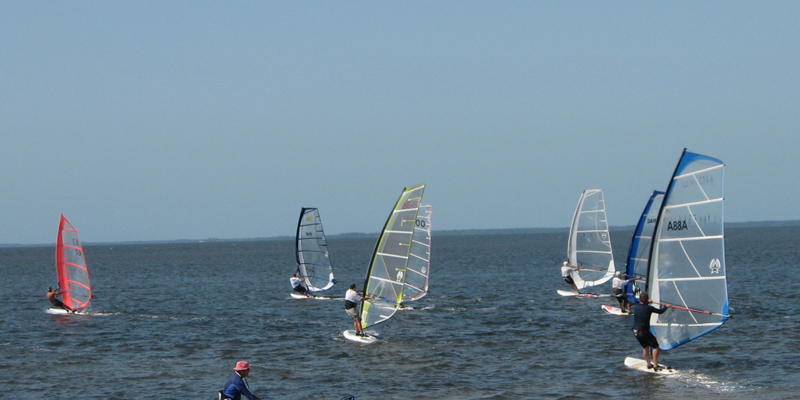 The spinnaker, multi-hull, and non-spinnaker fleets will race in Apalachee Bay. The Portsmouth/One Design fleets will race off of the Shell Point Beach starting just south of the stage. Trophies will be awarded for first, second, third, fourth and fifth place for each fleet in the series. The Anne Sherwood trophy will be awarded to the winning spinnaker fleet boat. The Dan Harbolt trophy shall be awarded to the winning non-spinnaker boat in the Non-spinnaker fleet.